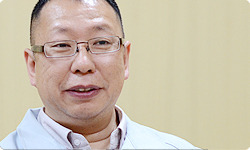 Takemoto-san, since New Super Mario Bros. U came out, you’ve been writing a lot on the New Super Mario Bros. U Community12 on Miiverse.12. New Super Mario Bros. U Community: A community within Miiverse specifically for New Super Mario Bros. U. Miiverse is an online community offered by Nintendo that is built directly in the Wii U system where Wii U owners from around the world can post messages and drawings to further enhance the Wii U experience. Masataka Takemoto posts under the name Masaccio. For more details, follow this link. Yes. 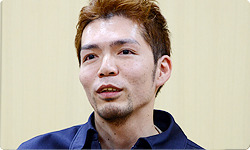 Also MariChan13, a staff member, assigns all kinds of topics like Time Attack or a few words on the screen.13. MariChan: A Nintendo staff member appearing in Miiverse communities related to The Year of Luigi. She is in charge of introducing events for the New Super Mario Bros. U Community. Everyone’s competing to see who can get the Nintendo official fastest record. Yes. Before I came here, I took a look at Miiverse, and someone had written a way to shorten course time by going a certain way at a certain place. The someone who saw that was able to cut down their time and wrote something new that went like, “You can go like this, too,” so they teach each other. That’s collective intelligence14! (laughs)14. Collective intelligence: Knowledge with a new, added value that arises when information from many people is gathered, opinions are shared, and discussions held. I think it’s great that the players have that kind of relationship with each other. I think it would be great if something develops from that for New Super Luigi U as well, so I’m thinking about a lot right now. This time, there are objects in the courses that make you want to write in Miiverse. Then the people who didn’t know about it will be thinking, “Where? Where?” (laughs) By the way, what are the hidden Luigis like? Takemoto-san, since New Super Mario Bros. U came out, you’ve been writing a lot on the New Super Mario Bros. U Community 12 on Miiverse . 12. New Super Mario Bros. U Community: A community within Miiverse specifically for New Super Mario Bros. There are things like small stickers of Luigi stuck in unexpected places on the courses, and there are Luigi objects and shapes hidden in the background. The stickers stand out so they’re easy to notice, but the Luigi objects are often out in the open, which makes them easy to miss, so you can pass right by. Because you’re so engrossed in playing. Yes. I thought it would be fun if people found the Luigis and shared that information on Miiverse, so others would say, “Argh! I totally missed that!” For that reason, I asked the designers to include more. While they’re just little perks along the way, they’re quite substantial. I’m glad we could put in what we weren’t able to do for New Super Mario Bros. U. In the very last course, we put in something that uses Mii characters, and we included searching for Luigi in each course, so I hope people will enjoy it, including posts to Miiverse. All right. Here at the end, I’d like you to say something to players who have New Super Mario Bros. U as well as to those who don’t. But they’re packed fuller, so you want to challenge yourself over again. Right. It’s in the same series, but I hope you will experience how much the atmosphere has changed compared to New Super Mario Bros. U. And as for those who don’t have that game, I just want them to try it. In some ways, it’s a 2D action game that you can play in a more leisurely way than New Super Mario Bros. U, so I think you’ll want to play again and again. This game is add-on content, so you can purchase it over the Internet, but I don’t think there are that many people that have experienced using Nintendo eShop to purchase a game. So to those people who have New Super Mario Bros. U, if you use Nintendo eShop, you will gain new gameplay at a price lower than usual compared to buying a single game, so I hope people will do that. I hope people would buy it and then enjoy the odd feeling you get when you see the New Super Mario Bros. U title screen change to the new one. And to the people who do not have New Super Mario Bros. U? I hope people will play both. I hope people will first play New Super Mario Bros. U, which is the one we made first – and it’s all right if you don’t clear it to the end – and then play New Super Luigi U and compare the two. By comparing the two, you can see what’s good about each one. Yes. You can enjoy the differences. In other words, as a single packaged game, New Super Mario Bros. U has plenty of volume, so it’s recommended for people who want to immerse themselves in that world. New Super Luigi U has picked out those elements that make you feel like playing over and over, so we can present it in a new format as add-on content. What I really want to say is, please don’t think it has nothing to do with you because it looks challenging. 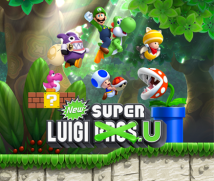 New Super Luigi U has the traditional aspect of Super Mario games in that you want to try again. That’s right. I think this software will cause you to recall the origin and essence of Super Mario. I’m very much looking forward to how everyone will receive this new effort. Yes. I really hope people enjoy it. The price is affordable, and the Luigi prepaid cards for play with Issho ni Photo: Super Mario15 have gone on sale, so… Oops, I sound like an advertisement!15. Luigi prepaid cards for play with Issho ni Photo: Super Mario: Available in Japan only, this is a Nintendo eShop Card with bonus content for play on the Nintendo 3DS system. Goomba, Mario and Peach were released in Japan on April 23, 2013. Koopa Troopa, Luigi and Bowser were released in Japan on June 29, 2013. You made New Super Mario Bros. U and burnt yourselves out (laughs), and then without a break, made another one. Thank you both for your hard work!